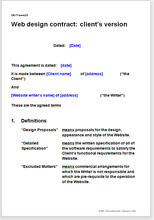 This agreement addresses almost all of the problems that may arise between you and your web writer, graphic designer or coder. It has been drawn as a fully flexible and comprehensive agreement so you can start a negotiation process with your contractor. It is suitable for larger or more complicated sites. The website design contracts have been drawn to protect you, the client, so any person or Company wanting to allocate website designing work to a professional website designer will use one of these Net Lawman documents. It covers graphic design, records, testing and all other areas of your work.